Whenever a bride gets proposed to, there’s a lot on her mind – what season she’ll get married in, the venue, her bridal party, her dress. It is easy to forget those small details that really add personality and individuality to any wedding. One of these details is the invitation that will be sent out to all of the guests! Coming from someone who is obsessed with fonts and design layouts, an invitation means everything. Heck, I’d probably be more interested in picking my wedding invites than I would my dress; does this make me any less of a girl? Here are a couple of invitation ideas that we absolutely adore! There is something homey about good ole’ fashion brown craft paper. These invitations are perfect for couples aiming to achieve a rustic-themed wedding chock full of homemade details. Just looking at these makes me picture a quaint outdoor wedding with hay bales for seating and mismatched table clothes. Regardless, of what images you conjure up when taking a peek at these “organic” invites, one thing is for certain: Ladies, your man cannot complain about the invites being too feminine. Who doesn’t love when your hubby-to-be has virtually no reason to disagree with you? Am I right, or am I right? In an ideal world (for girls, that is), a woman should have complete and utter control of all design aspects of her special day. 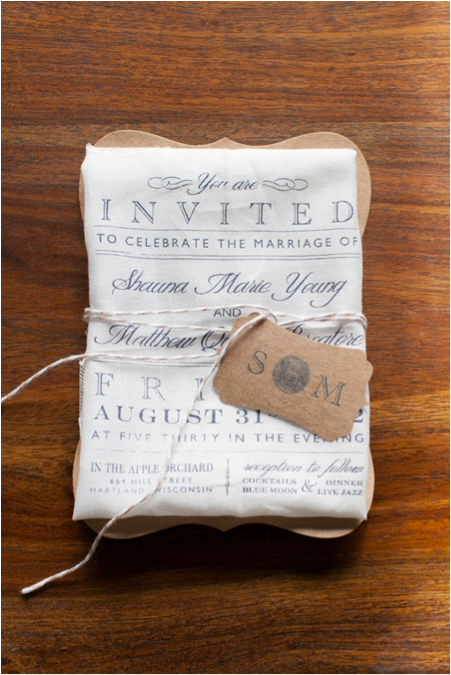 With that being said, these invitations by Paper Rifle Co. are stunning. There is something about the simplicity of the rounded corners and the curving font that make this choice of invitation soft, yet oh so appealing to the eye. 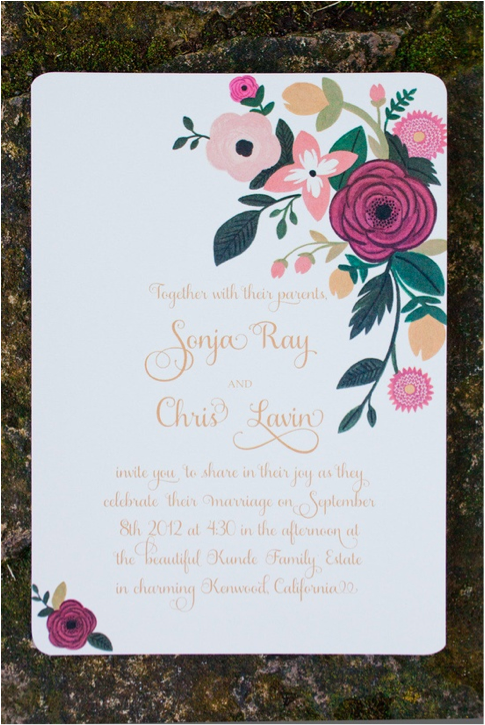 Not to mention, the floral print is in the most gorgeous color palette – tangerine, fuchsia, blush, and a winter green? Please… Just try to deny this beauty! Alright, for those of you aiming to be super fancy schmancy, in a not so “in-your-face” sort of way, think of printing your invitations on a handkerchief! This is an awesome keepsake idea; your guests will rave about your creativity and will be able to carry this little beauty with them on your wedding day! You will be more environmentally savvy, too! All too often, beautiful wedding invites end up in the recycle bin… or worse, the trash! I guarantee you that your guests will be reluctant to throw out this personalized, non-paper invite! One can never know when he or she will be in need of a hanky again, right? We could be a bit biased here at Pastore Events, but the invites that Little Woman Design produce are nothing short of amazing. Look at it this way: if you are a woman that wants an invitation that will be unique to you and your fiancé, you’ve come to the right place! Send out a save the date with drawings of you and your man as the focal point. These are the perfect balance of cutesy and personal. The fact that no other bride will ever have the same invitations as you had is pretty darn cool, too!